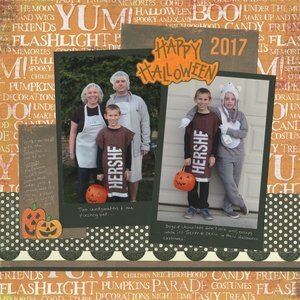 Here's the second (of two) pages about Halloween 2017, ready to go in the album. I usually do one page about Trevor's costume, then a second page about trick-or-treating. On the topic of trick-or-treating, I'm curious what age you consider the upper limit. Back in my 1970's California neighborhood, kids stopped going out when they left elementary school, which in my case meant my last year trick-or-treating was in 5th grade. But now, around here at least, there is an expectation that kids will trick-or-treat quite a bit longer than that. I'm totally fine with preteens and teens trick-or-treating, provided that they are polite, in costume, yield to smaller children, and don't stay out ridiculously late. In many ways, kids have to grow up so fast now. I am happy to let them have one extra night a year of just being a kid and having fun. I agree w/ your view. I'm totally okay w/ older kids trick-or treating, but yes, be polite, and wear some sort of costume...draw cat whiskers on your face at least! I hate when the older kids come to my house dressed in their regular clothes. Oh, and don't come to my house more than once...that's just greedy! I'm not really a fan of Halloween, LOL... though I try, for my husband who LOVES it! Definitely don't go to the same house more than once! That's definitely rude, no matter the age. Oh geez, and I forgot to tell you how much I love your layout! Love the mix of the Halloween Themed paper w/ the 2 different types of Black & White Polka Dot Papers! Because of Brookie's height, a lot of adults have been giving her crap since she was 9 while trick-or-treating -- 'aren't you a little too old for this?' -- and there is me and Brian right behind her - with him saying, 'she's only 9' (or 10) -- ohhhh and I let him do the talking, cause he is a LOT more PC than me when it comes to people being rude like that! LOL! She was going to stop last year, and just hang out with the grandparents and hand out candy, but then her school hosted one of those 'Fall' night things, so she ended up getting the last minute nerd costume and going to that. This year she says if the school does something again, she will support that, but if not, then she will be helping the grandparents hand out candy, we shall wait and see! LOL!! I loveeeeeeee your lo! Loving the photos and that background paper you chose!!!! That's horrible. I'm sorry that has happened to her. All the more reason to be kind to 'teenagers' who come to the door... they might not actually be teenagers.